Justice newspaper, Labor Notes and SocialistAlternative.org have chronicled the strike and victory of hospital workers at Temple University in Philadelphia. The labor movement has been riddled with defeats, and this strike is a shining example of well-organized workers’ struggle for a better future. Strike leader and Socialist Alternative National Committee member Marty Harrison recently provided this exclusive interview. SocialistAlternative.org (SA): You view this as a victory despite some of the compromises the union made to settle? Marty Harrison (MH): Absolutely. There is no doubt in my mind that the union is going back into the hospital stronger and more unified than ever. Our power has grown and management knows it. That’s why they came up with this new uniform policy which bans union buttons and scrubs. We will defy it and we will win, again. Ultimately, we won because we were fighting for patient care and we need a strong union to do that effectively. We have to be able to stand our ground without fear of discipline to advocate for our patients. SA: Tell us about why the union compromised on the hospital’s health insurance plan when it had successfully beaten back so many of its other concessionary demands. MH: Health insurance benefits were a priority for both sides from the very beginning. The hospital had already imposed its plan on management, on the members of 1199/AFSCME and on nurses at another Temple-affiliated hospital. They were committed to imposing it on us to the very end. It became very clear during the final hours of negotiations that to win on health insurance, we would have to stay out longer. We had to decide if the advantages of going back to work with this tentative agreement outweighed the concessions on health insurance. The majority of the membership agreed that it did and voted for the contract. They couldn’t stay out longer, they had reached the end of their rope financially. The 30 ”no” votes were from members who were prepared, financially and otherwise, to stay out until we could get more. But remember, we did move Temple off its demand to be able to change or eliminate plans and increase premiums during the life of the contract. SA: News reports cited Congressman Bob Brady’s involvement as critical to the union’s success. Talk about the role he played. MH: Congressman Brady approached the union the first week of the strike to get our side of the story straight from us. I respect that. He said he would do what he could to pressure Temple to return to the bargaining table, because, as he said, you can’t come to an agreement if you’re not talking. All of Temple’s federal stimulus money goes through Congressman Brady, and he promised not to release a dime until we settled. Obviously, I don’t know exactly what the Congressman did, but Temple called for a bargaining session two days later. During the final four-day marathon bargaining session, Bob Brady stood for hours in the hallway of the hotel and made calls from his cell phone back and forth with Temple. The last day he met with the union buster, Ed Notebaert. After that meeting, Temple backed off of its demand that we sell out our members who were owed $7,000 to $15,000 each for their children’s back tuition in exchange for a new dependent tuition deal. He definitely played a positive role, but, to me, it just showed the potential of what workers’ party representatives could do in these situations. Our power is in the workplace and in our work. The politicians have power far beyond the workplace. They control millions of dollars that these so-called “not-for-profits” rely on to balance their budgets every year and money talks. What we could do and couldn’t do during the strike is so limited by labor law. If we had a political party for workers, then we could start to change some of those laws. This would help us organize really effective strikes. SA: Explain some of the legalities. MH: The first legal barrier we hit was in September, before the contract expired. We had given notice for a 3-day strike. Our union staff realized that if we went out on strike, Temple could impose the terms of its LBFO on us when we returned just by saying that negotiations had reached an impasse, even though they hadn’t. 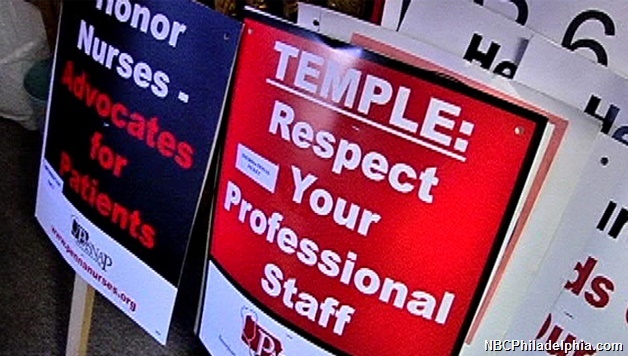 By the time the case worked its way through the Labor Board, Temple would have what it wanted and we would have been digging ourselves out of a hole instead of fighting from the position of our old good contract. So we pulled that strike notice and worked 6 months without a contract, getting prepared for an open-ended strike. At Labor Notes, I talked to a nurse from California who has been working under an LBFO for three years after going out on a limited strike, so it really does happen. Once the strike began, we had to follow all these rules on the picket lines. If we broke the rules, the hospital could get an injunction against us and limit the picket lines to just a few people at each entrance. That would really have limited our power. Our picket lines were so energized and spirited because there were so many of us out there. We never did get an injunction because we followed the rules, but that means we couldn’t stop the scabs from going in and out. The strike wouldn’t have lasted about an hour if we could have stopped the scabs. There simply aren’t enough nurse managers to take care of all the patients and the hospital hadn’t transferred anyone out. Also, sympathy strikes are illegal, so the members of 1199/AFSCME and Operating Engineers who work in the hospital had to cross the picket lines and go in to work with the scabs. The strike would have lasted less than an hour if none of the other union members had gone in. Who would mop the floors, empty the trash and answer the phone? Not my nurse manager! The labor movement in general has to take up this issue of how to stop the scabs in a serious way. At Labor Notes I also got to talk to locked out miners from the Rio Tinto mine in California and striking miners from Vale Inco in Ontario, Canada. Both of those mines are being operated by scabs and so the situations drag on and on. Either we live within the corner labor law has boxed us into and lose, or we figure out how to win outside the box. Next articlePeace Activists Murdered by Reactionary Israeli Army — Build a Mass Movement to Break the Sanctions on Gaza!